Over 600 species of birds are illustrated and described! >> Beginners Bird Identifier at the bottom of this page. A useful tool for any beginner birdwatcher. >> Advanced Bird Identifier (Britain and Ireland only) click here. Great if you got a good view or know a bit about birds already. Instantly identify any bird! In just 4 easy steps using our form below. 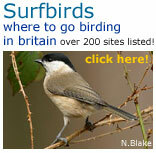 To make it simpler for you, only the most regular birds of Britain and Europe will be shown. HINT: If you are unsure of anything, just leave it blank. If you can't find your bird first time, try again by leaving some sections blank and you will get more results to choose from. Where did you see your bird? How big was your bird? Was it similar in size or smaller than a sparrow? Was it larger than a sparrow but the same size or smaller than a pigeon? Was it much larger than a pigeon? Was your bird in or on a large body of water such as a lake or ocean? What colours were on your bird? Select one or more colors that you saw on the bird . If you are unsure of any colors, don't select those colors.
. Brown . Light Blue . Cream .
. Blue . Dark Grey .